It Works… but does it really work? So with that said, hey girls! It’s Bonny here, and on this fine morning, we’re going to slice and dice the increasingly popular “body wrap” brand, you know, that crazy body wrap thing by – It Works! I’ll review it for you below plus we’ll see some (really nasty) It Works reviews (and complaints) by other buyers. Here’s the usual table of content if you wish to jump to sections. 2. But, Does It Works Really Work? 3. It Works Skin Care Products – Yep They Got That Too! 6. Forget It Works - These 3 Simple Habits Can Help You Much More! It Works, based out of headquarters located in Bradenton, Florida; is a US-based fitness company that sells products for body and skin wellness. The company is widely recognized for its product called -The Ultimate Body Applicator. So what does this Ultimate Body Applicator do and how does it work? Before we get into that, let me just get into the company details first, trust me, this is going to be useful later. 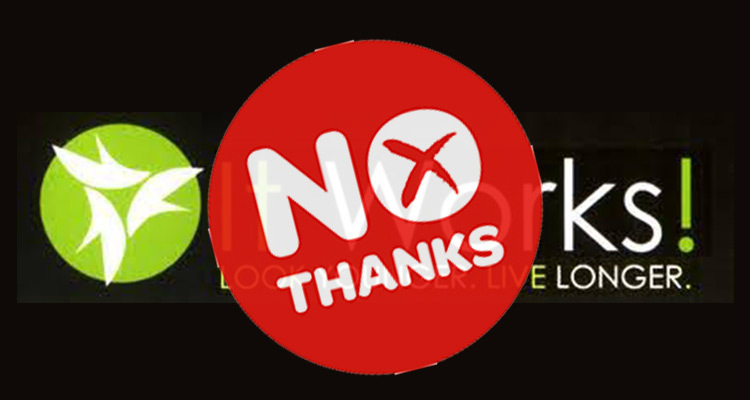 So, It Works was formed in 2001 when the current CEO of It Works, Mark Pentecost, came across a product that was seemingly an alternative to cosmetic surgery, body shaping tummy tuckers and the like. Since then, this product marketed by Mark and his wife, Cindy Pentecost, has gained worldwide popularity. Besides marketing products that help you lose weight, the company also has a line of skin care products. Furthermore, the company also makes its money off of selling protein shakes and dietary supplements (I mean who doesn’t have their own supplement these days, eh!?). So all in all, the company's products sounds like your typical trending things in the market that everyone wants to jump on to (and push to their neighbors!). 2. But, Will It Works & The Body Wrap Really Help You? To answer this question, let’s discuss their highest selling product – The Ultimate Body Applicator. Now, if the name isn't self-explanatory enough, it is a product that you apply to lose weight. Instead, the body wrap is solely advertised as - ‘you can achieve tightening, toning and firming results’. I guess another reason would be that the FDA will own their a$$ if they advertise this as a weight loss product without scientific backing (Which.They.Don't! More soon). However, even though the product is marketed brilliantly, I don’t remember the last time a product helped me achieve any results while I sat with my bowl of popcorn and my laptop balancing on my belly. Nope, it really doesn’t work that way folks, c’mon, you know better by now. To elaborate further, the Ultimate Body Applicator (let’s simply call it the body wrap from now on) is a “non-woven cloth wrap” that has a biological lotion on one side. One pack of this product comes with one such wrap that you open and simply apply on the designated area where you’d like to witness these tightening, toning and firming results (duh, your stomach, your thighs… ummm... your brain maybe!). Now, you’re supposed to wear this applicator or body wrap for a period of 45 minutes. So if you’ve got any major plans in the next 45 minutes, they suggest using this product on some other day (or not entirely as I suggest!) because you probably don’t want to look like a walking piece of plastic ravioli in front of your nearest and dearest. One upside is the It Works body wrap does list all the ingredients that are used in their lotion/cream. Nonetheless, and not surprisingly, it fails to mention *HOW OR WHY* The Ultimate Body Applicator actually works or the science behind this miraculous cloth wrap. The only information that is provided is that contrary to other body wraps that lead to weight loss on account of water loss, this body wrap uses its lotion/cream to help you with your tightening, toning and firming results. As much as I wanted to believe, at least for the purpose of this review that the It Works body wrap could help me shape my body, it… well, didn’t. Not even a pound. My regular readers know that I see and review a lot of products marketed with ambiguous taglines and meanings, products that enshroud themselves behind mirrors and smoke screens, but very few of these products actually end up having any long-lasting effects. You'd most definitely have a better chance trying to hit the gym thrice a week and focusing on eating healthy instead of looking like you just covered yourself with some Saran Wrap! The company also recommends drinking a lot of water when you use the body wrap but with the recent cultural wave of gym-goers, any layman who can pick up a dumbbell could tell you that… that’s how generic this advice sounds. Yeah, the whole shebang. They've got a facial masks, a toner, a cleanser, a cream for stretch marks and two creams for anti-aging and a couple other products in this domain. Honestly speaking, I am more than willing to buy a skincare product that's going to help me rejuvenate my skin by exfoliating oil or dry skin, thus I am willing to truly give some of their skincare products the benefit of the doubt. However, just like I know that a magic pill won't help me lose weight, I highly doubt a cream could help me get rid of my lines and wrinkles. I firmly believe that active steps could be taken to minimize these lines and wrinkles or conceal them for a short period of time, but I don't think a 'skin care' product could help me stop or reverse the process of aging. A healthy, decently clean diet + regular intake of clean water + getting a good sleep every night will probably do you more good (READ: much more good) than any of these skin care products... whether the product is from the It Works line or any of your over the counter skin care products. They also have a line of products, ironically named as, wait for it… the ‘Greens’. Here at Skinny Bonny we have another three-word slogan for these type of “green products” - ‘alkalize, balance and detoxify with Greens’. I will say that all these taglines are the works of a very brilliant sales and marketing team. This green blend is a whopping blend of 52 herbs. With 52 herbs in one product, I guess it’s safe to say that at least 5 of them are going to do you some good. It is actually a dietary supplement, available in 3 flavors - chocolate, berry, and orange; that you can gulp down with water, but the general rule of thumb applies… that is, do not use it as a meal replacement and drink plenty of water during the day. It’s probably the only product on their line that I wouldn't shun completely in my review because a dietary supplement can actually do you some good as long as you don't skip any of your other meals. Of course they have a line of products named ‘Lifestyle’ - which includes protein shakes, energy drinks, pro-biotics, Omega-3 capsules and some other obscurely titled capsules that I wouldn’t really recommend trying. The reason is of course, the exorbitantly high price! So my advice is constant - save your time and (a lot of your) money by sticking to a healthy, decently clean diet and a workout program that fits your schedule. It Works may have some short-term effects but in the long term, nothing that is packed in a wrap, or a capsule is going to be beneficial. So when I first heard that It Works is an MLM company, I was pretty sure that I’d get the usual ‘rainbows and unicorns’ review all over the web! There are some pretty pissed off It Works complaints from their customers. I mean there are over 400 complaints and negative feedbacks on BBB for them. I have contacted the company several times since receiving my first order in March I had an allergic reaction to their product and they refuse to stop. They continue to send the product and deliver it to me and refused to refund my money. This was a complaint on the BBB site - on August 21, 2018. The company did respond to the user, but it wasn’t satisfactory, and the user pressed on for a refund. Whether he/she will get it is a different issue! I complained about this auto shipment that I wasn't aware of and then I'm told that I'm actually signed up three months of automatic shipment and if I cancel this automatic shipment I will be charged a $50 membership fee. Then after fighting with two different people over the phone I'm finally told that they can push the auto shipment out a few months to give time for compliance to investigate. She said her reason for not telling me was that she plans for the best and she's never had anyone want to cancel. So she admits to using deceptive business practices in the sign-up process but the company says that since I signed myself up somewhere along the line I agreed to all this and so they're not allowing me to cancel without charging me a $50 fee. Charged my debit card after I called and cancelled my order. Have not refunded my money. Ordered 3 products one time from a friend, found out a month later that another distributor signed me up for three months of auto shipments. Now I have to wait until I get the shipment that I never ordered and return it with no refund. The above customer had to mail them multiple times before getting her refund (god knows whether she even got it). there are over 400 It Works complaints on the BBB site! It became so horrible that the BBB has now put up a WARNING on their site about this company. And I‘m not saying a company, specifically a company that’s working in the weight loss industry will not have negative reviews, but the important thing is WHAT are the reviews and users complaining about? If they’re complaining about your scam business practices, then that’s a HUGE red flag for my readers. So I got that crazy wrap thing back in March 2018, no thanks to my nosey neighbor. However, thankfully, since I knew about their scammy practices I was able to avoid their auto shipping cycle. I sincerely wanted to review the body wrap so I could tell you girls about it. And guess what… that crazy wrap thing did… NOTHING. Nothing, nada, not even an inch of “toning”, not even a pound dropped. Results in 45 minutes they say… well, I used it over 15 days, but nothing. Of course I wasn’t surprised as I was expecting exactly that. YOU GAIN WEIGHT BECAUSE YOU INGEST MORE THAN YOU EXPEND. HOW MUCH PROTEIN/FATS/CARBS/(INSERT ANYTHING HERE) YOU EAT DOESN’T MATTER. 1. By hook or crook - whether you ingest less energy (food) than you expend (burn). 2. And whether you have some real life habits to ensure... the above! That’s it folks. NOTHING else matters. You take ONE, single habit (one small, tiny change) in your life and you keep doing it until it becomes a no-brainer in your life. THEN, you take a second habit… and so on. You keep repeating this cycle for months and if you do it foe just a year, you see a new you in front of the mirror. Hoping, praying, begging, wanting, dreaming... doesn’t work. Tiny, small, wee, petit actions work. EVERY time. 6. Forget It Works - These 3 Simple Habits Can Help You Lose Much More Weight Fat! If you ever read any of my other posts, you know that losing weight fat, is not about fancy body wrap things or products with awesome packaging. Rather, it's always been about the simplest (read:free) things. And not surprisingly, all these fancy body wrap companies like It Works WON’T talk about these things. Here's a challenge for you, just pick any ONE habit from the following three, and diligently follow it for just one month. Then come back and tell me what happened! Firstly, did you know that almost two thirds of your body is comprised of water? And not only does it make up the majority of your body, but water is also important within the body to help remove waste, regulate body temperature, and lubricate joints! Time and again, studies have proven that water is incredibly important to your weight loss journey because water helps with metabolism, and acts as a natural appetite suppressant. When you’re dehydrated, you can feel tired, unable to concentrate, unable to visually focus, and/or generally fuzzy. Dehydration is also associated with premature aging, an increased risk of cancer, anxiety, irritability, and obesity. Dehydration also affects your hormones-when your body is dehydrated, its resistance to insulin increases,while the levels of testosterone decrease,resulting in more fat storage, and as the testosterone decreases,an increase in abdominal fat (specifically). Water also helps the liver stay on track: when the body is dehydrated, the kidneys don’t work as quickly. When the liver then steps into help, ignoring its normal responsibility (which is to metabolize fat), fat loss process is then either stopped or significantly slowed down. Water is additionally helpful with weight loss because it increases your energy (allowing you to push harder in your workouts, and generally remain more alert and engaged), eliminates hunger pangs (resulting in less caloric intake), and increases your metabolism (Dickinson, 2015). 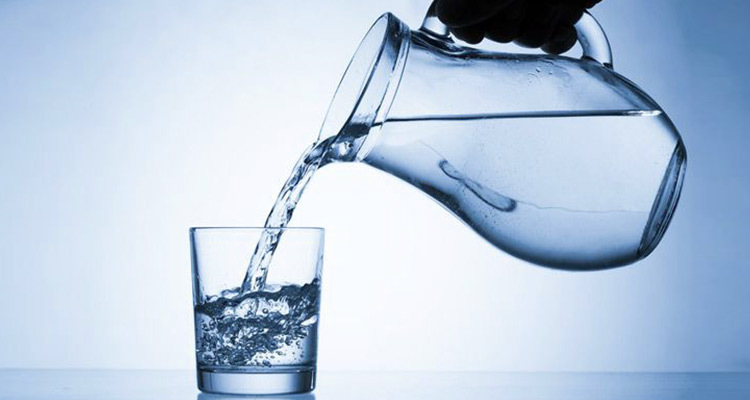 Water is used to process calories, so drinking more water will also help increase your metabolism! Not to mention, water makes up nearly 75% of muscle tissue, while it only makes up 15-25% of fat. Therefore, as you dehydrate, the areas that are made up of muscle are affected first (negatively), while the fatty areas aren’t affected as quickly. Drinking water was easy for me-it was something that immediately made me feel better and more awake as soon as I started it. I drank at least 8 glasses (containing 8 ounces of water) a day. I achieved this in several ways: sometimes I added lemon and cucumber slices, or orange slices, or mint leaves, or frozen raspberries to the water to give it some flavor. I also got a big water bottle, and labeled it with the hours of the day, as a reminder to myself to drink a certain amount of water by certain times of the day. Yeah, I had to pee a lot, but it was totally worth it. My skin looked better (much better than any It Works skin care products would have made! ), I felt more energetic, and I noticed that I stopped feeling bloated. I noticed a small change in my belly area -not enough to do that alone as a way of achieving weight loss, but definitely enough to help! And definitely better than that crazy wrap thing people! 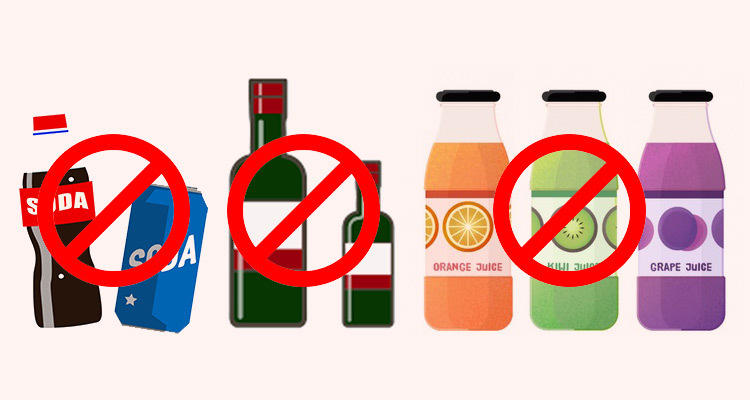 HABIT 2: Cut Out ALL Sodas, Fruit Juices & Alcohol From Your Life! I apologize to all you soda drinkers, cocktail lovers, and fruit punch connoisseurs! Those drinks aren’t good for you, and I’ll tell you why. First, it’s important to cut out sugary beverages, as you probably know they not only contain empty calories, but what you don’t know is - they also put your body at a disadvantage when it comes to absorbing the water it’s trying to gain from the beverages. In addition, caffeinated drinks (such as sodas, coffee, etc.) can be even more dehydrating to your body, because caffeine acts as a diuretic, causing more water to be removed from the body. In addition, removing carbonated beverages helps to decrease abdominal bloating, while alcohol is not only a very dehydrating liquid, but it additionally has so many empty calories your body doesn’t need! Personally, it wasn’t difficult for me to cut out alcohol or fruit juices/punches from my diet. I was never a fan of them, so I didn’t feel a great loss when they were no longer in my diet. However, I did struggle to give up Coke back then. I love drinking Coke-the sugary taste complimented one of my other favorite (bad!) snacks: potato chips! I also found myself often reaching for a Coke while I was grading papers, and just generally starting the day with one as I drove to school. For me, I decided to cut the Cokes out gradually: I gave myself one week (once I started to pursue my weight loss) to drink everything normally. The following week, I cut the amount down by a quarter, and then the following week by another quarter, etc. Eventually I had weaned myself off of them, and though I still miss them, I know I’m so much better off without them. Now, let’s talk about green tea. Green tea (NOT the green tea flavor) contains an antioxidant known as epigallocatechin gallate, or EGCG. This is a great health-boosting antioxidant that aids in weight loss. Green tea also contains caffeine, but less than a cup of coffee (so It can be used as a good substitute-one that isn’t so dehydrating!). That specific antioxidant I mentioned,EGCG —it helps inhibit an enzyme that breaks down a hormone called norepinephrine. When the level of norepinephrine is increased in your body, it tells the nervous system to go ahead and break down fat in your body. The more norepinephrine there is, the more of a signal your body receives to break down fat, resulting in more weight loss! And It Works won’t tell you this! Why? Cause it doesn’t require you to buy their body wraps, or other scam products! In addition, green tea has also been found to be an appetite depressant, which would help you to take in fewer calories (Gunnars, 2014). Keep in mind that the benefits of green tea come from green tea alone, and not green tea mixed with other flavors, orsugar/artificialsweeteners (Sizensky, 2012). It is usually recommended to use a green tea brand that uses all natural ingredients, and doesn’thaveany artificialpreservatives,as the qualityof the greentea leavesand the addition of unnecessary ingredients does make a difference. I have to be honest here though - I don’t love green tea, but I do know that when I started to drink it, I DID lose a couple inches off my waistline,of course, as part of the combination of not drinking Coke. But hey, just two tiny habits and I was seeing results! HABIT 3: Forget That Crazy Wrap Thing, Embrace That Fiber Thing! Instead of totally wasting your $ on The Ultimate Body Applicator, a fairly easy thing to do that can decrease belly fat? Found in many (most) vegetables &fruits,fiber moves through your digestive tract without being broken down, which helps move other items through your digestive tract, while also keeping you full! Studies have found that by eating more soluble fiber from vegetables, beans, and fruits, you can significantly reduce visceral (abdominal) fat. One study found that for every 10 grams of soluble fiber eaten in a day (as an increase from one’s previous diet), the amount of visceral fat (that’s the bad fat that I mentioned that usually sits around the abdomen, and goes around the organs!) is reduced by 3.7%! In case you’re wondering what ten grams of soluble fiber is, it’s equivalent to eating ½ cup of pinto beans with a full cup of green peas, or two small apples, that’s it. Eating foods with fiber wasn’t too difficult for me to implement into my diet. To be honest, I didn’t know so many things contained fiber! Foods containing fiber are peas, whole-wheat pasta and bread, edamame, corn, lentils, brown rice, avocado, raspberries, artichokes, broccoli, barley (as a whole grain), oats (oatmeal! ), pears, apples, almonds, and beans (white, black, garbanzo, and kidney). I made a point to pack snacks with me throughout the day to make sure I was getting my daily dose of fiber. A bag of almonds, sliced apples, a cup of oatmeal for breakfast in the morning-it all went a long way to helping me lose that weight! I keep telling you - it’s the simplest things like planning and small habits that work, not some pricey body wrap! So that’s that folks. It Works has a HUGE marketing army on their side, blatantly promoting their crazy wrap thing and other silly products. 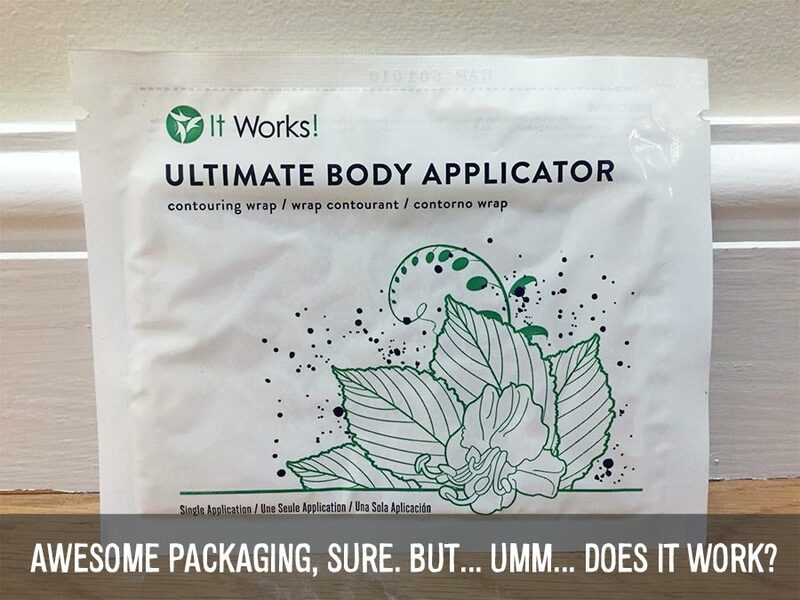 No, It Works body wrap does not work. Period. You can trust me and other reviewers like the ones above, or you can waste many a $, get trapped in their auto-billing scam, and then find it out yourself. That crazy body wrap thing is exactly as it sounds – crazy! You do not ‘need’ it to lose weight. Once a company sees (scammy) success in one industry, that’s when they make their jump to another… enter the make-up and other “health products”. Avoid. Period. If YOU wish to lose weight, follow my two step advice: Find a method to eat less (or burn more, as end result is same). Form habits that will help you do step one. Repeat… till you get to where you want to be. Read the above point... at least 3 times! Download my It Works Body Wrap Alternative - The 8 simple habits that you can start doing TODAY, which will give you better weight loss results in just 30 days than any body wrap or other magic thingy! 8 Simple Habits - It Works! Q: What is It Works? It Works is a US based company that produces "wellness" products. Which means it started with dubious weight loss products, made millions, then moved to other dubious products! 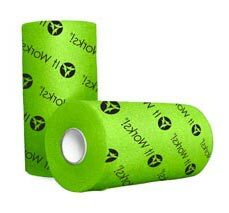 Q: How Do The It Works Wraps Work? They tell you to apply the body wrap for a while, and then it shrinks fat. I don't think I need to explain the ridiculousness in this. In short - save your money. Q: How Much Do The It Works Wrap Cost? 100's of dollars! It's an addictive thing. You buy the body wrap, next thing you know, you've purchased their green products, skin care, etc. My advice - you don't need these overpriced products. You'll get the SAME things/ingredients in generic brands for 1/4th of the price these people charge you for.